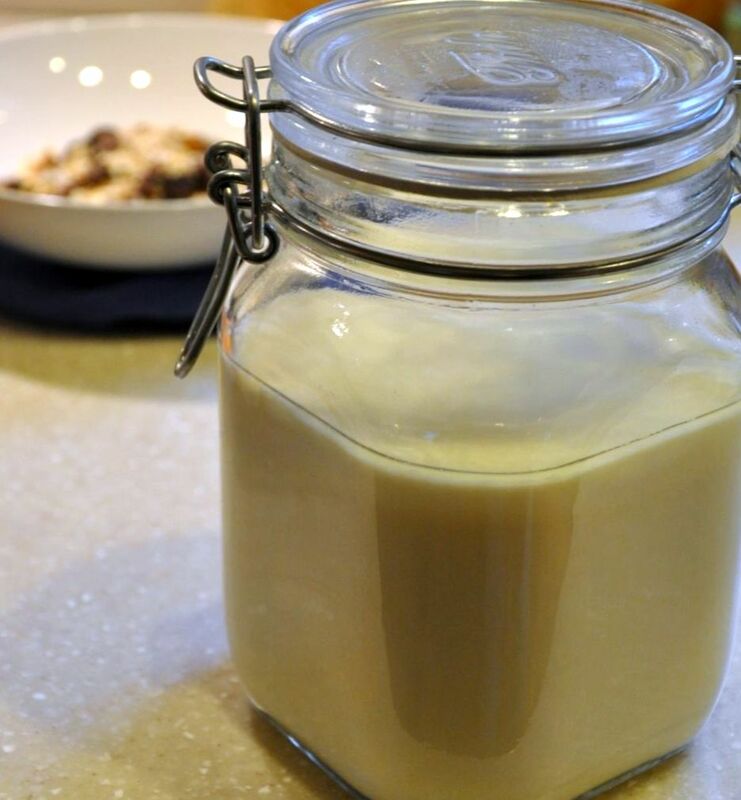 Homemade yogurt is easy. Amazingly easy. I had been waiting for a long time to make yogurt because I wasn’t sure if I had everything needed to safely turn milk into yogurt. Turns out you don’t need any fancy temperature setting heater or even a thermometer. Just take milk, a pot, some plain yogurt, and a jacket and you can make it yourself. The great thing about homemade yogurt is that you can experiment. The first batch I made with skim milk, and basically it turned out to be a somewhat bland, tasteless yogurt that worked well with granola and frozen fruit. In the near future, I plan to experiment with higher fat milk, and even something like goat or sheep milk. And, if you have a half gallon and you don’t expect to finish it soon, turn it into yogurt before it curdles in the fridge. Pour all the milk into a pot, and bring to a boil. Then, let the milk cool until you can stick your finger in it. Move the milk into the glass jar. Add the plain yogurt and mix briefly. Close and seal the jar (if it has a lid with a silicone seal that is the best) and wrap it in the blanket. Let it sit overnight, and you’ll have yogurt in the morning. For the granola, mix all the ingredients (try to make sure the brown sugar isn’t lumpy) and spread over a sheet of aluminum on a cookie tray. Toast in an oven until brown sugar is melted. I left everything in for about 30 minutes in a small toaster oven. 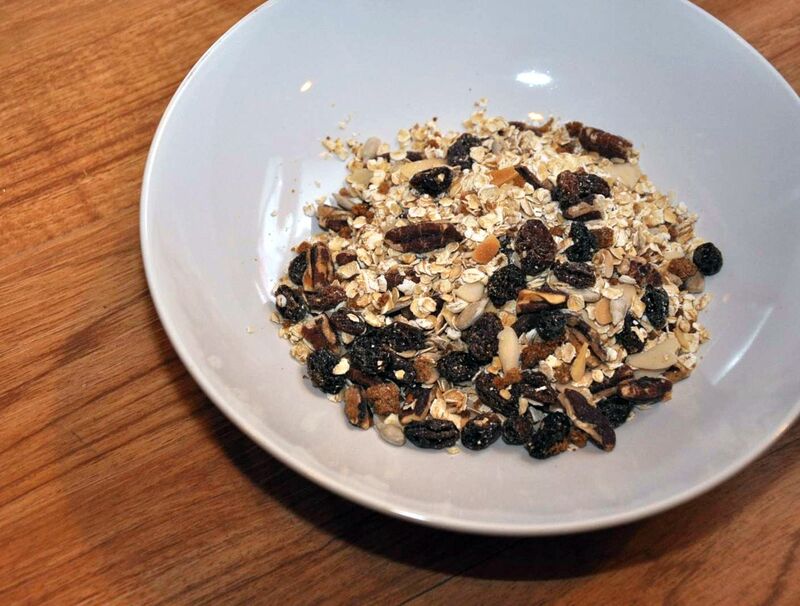 This granola recipe was made up on the spot and perhaps a better one will be coming in the near future. 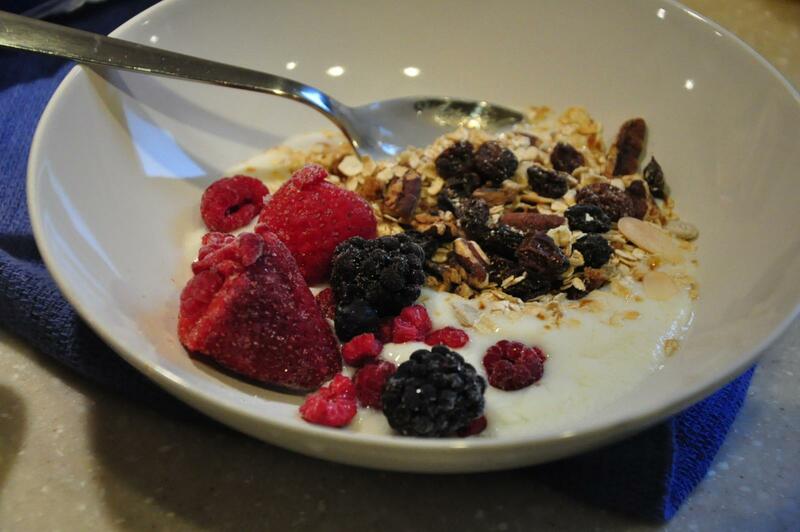 To top the yogurt parfait, add yogurt, a layer of granola, then a layer of berries. Frozen raspberries and blueberries work great, and if Haymarket fruits are available, fresh strawberries would be delicious as well.